When you think of a broken heart, you'd probably think of a cartoon drawing with a serrated line through it. But a real life broken heart can in fact, lead to cardiac consequences. This is a temporary heart condition caused by stressful situations such as death of a loved one. A person with broken heart syndrome may have sudden chest pain or think they're probably having a heart attack. The symptoms of this condition may be brought on by one's heart's reaction to a rush of stress hormones. In broken heart syndrome, a part of one's heart temporarily enlarges and doesn't pump well, while the rest of the heart functions normally or with even more powerful contractions. This condition was initially called Takotsubo Cardiomyopathy. Today, it's also called Stress Cardiomyopathy, Stress induced Cardiomyopathy or apical ballooning syndrome. 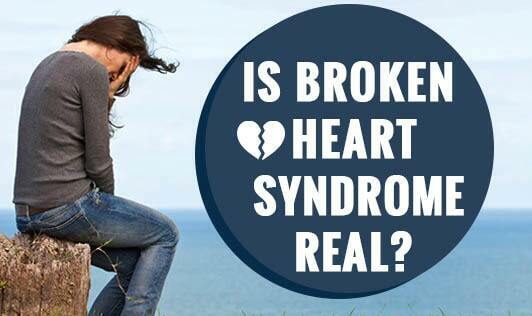 Broken heart syndrome is different from a heart attack. Most heart attacks are caused by a near or complete blockage of a heart artery which is due to a blood clot forming at the site of narrowing from fatty build up in the wall of the artery. On the other hand, in broken heart syndrome, the heart arteries are not blocked but the blood flow in the arteries of the heart may be reduced. Keep in mind that any long lasting chest pain could be a sign of a heart attack; hence it's important to take it seriously and contact your doctor. There's no proven therapy to prevent future episodes, however doctors suggest that long term treatment with beta blockers or other similar medications can reduce the damaging effects of stress hormones on the heart. Hence, managing stress in life is very important.